Sir Joseph Rotblat (1908-2005), British physicist and one of the most prominent critics of the nuclear arms race, received the Nobel Peace Prize in 1995 in conjunction with the Pugwash Conferences on Science and World Affairs, an organization of scientists which he headed at the time, for their efforts towards nuclear disarmament. 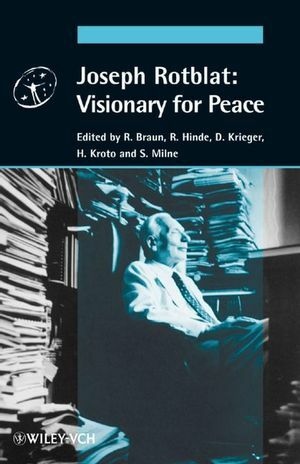 'Joseph Rotblat - Visionary for Peace' is dedicated to the life of this unique scientist and humanist. It contains contributions by Nobel Laureates, eminent scholars and prominent politicians who, each from their own perspective, shed light on the life and work of this distinguished scientist. An introduction by the editors is followed by five central articles on Rotblat's biography, the impact of his work on science and peace and the Pugwash organization. The third part of the book consists of over 30 commentaries, written by the likes of Martin Rees, Mikhail Gorbachev, Jack Steinberger, Mohamed ElBaradei, Paul J.Crutzen, and Mairead Corrigan Maguire. Reiner Braun studied German Literature, History and Journalism. Since 1982, he has been actively involved in the Peace Movement, working as Executive Director for Scientist for Peace and Sustainability (Germany) and the International Network of Engineers and Scientists for Global Responsibility (INES). Since 2004, Reiner Braun has been working for various projects related to the Einstein Year 2005 at the Max Planck Institute for the History of Science in Berlin and for the Max Planck Society. Robert A. Hinde, CBE, FRS, FBA, took a degree in biology at the University of Cambridge and a D.Phil. at the University of Oxford. He was later awarded a Royal Society Research Professorship, and worked at Cambridge on animal behaviour using monkeys as models for assessing the effects of brief periods of maternal deprivation. Since the mid-seventies he worked on human personal relationships, with special reference to the relationships between individuals in human families. He was Master of St. John's College, Cambridge, from 1989-1994, and since then has written on the bases of religion and morality in human nature, and on the causes of international war. He is Chair of the British Pugwash Group. David Krieger received his Ph.D. in political science from the University of Hawaii. He is a founder of the Nuclear Age Peace Foundation and has served as its president since 1982. He has initiated many global projects seeking peace in the Nuclear Age and the abolition of nuclear weapons, and provided leadership to these projects. He is the author and editor of numerous books on peace, disarmament and global security. Harold Kroto received a B.Sc. (Chemistry, 1961) and a Ph.D. (Molecular Spectroscopy, 1964) from the University of Sheffield, England. After postdoctoral work at the National Research Council (Ottawa, Canada) and Bell Telephone Laboratories (Murray Hill, NJ USA) he started his academic career at the University of Sussex, England, in 1967. He became a professor in 1985 and a Royal Society Research Professor in 1991. In 1996 he was knighted for his contributions to chemistry and later that year, together with Robert Curl and Richard Smalley (of Rice University, Houston, Texas), received the Nobel Prize for Chemistry for the discovery of C60 Buckminsterfullerene, a new form of carbon. Sally Milne graduated in Modern History from the University of Exeter, England, in 1964. She worked in the World Bank Division of the Food and Agriculture Organization of the United Nations in Rome, Italy, then returned to the UK to pursue her professional career in education and training. From 1992 to 2002, she edited papers for the Pugwash Conferences, and went on to become Personal Assistant to Professor Sir Joseph Rotblat until 2005. She is currently the Executive Secretary for British Pugwash and brought the US PeaceJam Education Programme to the UK in 2006.